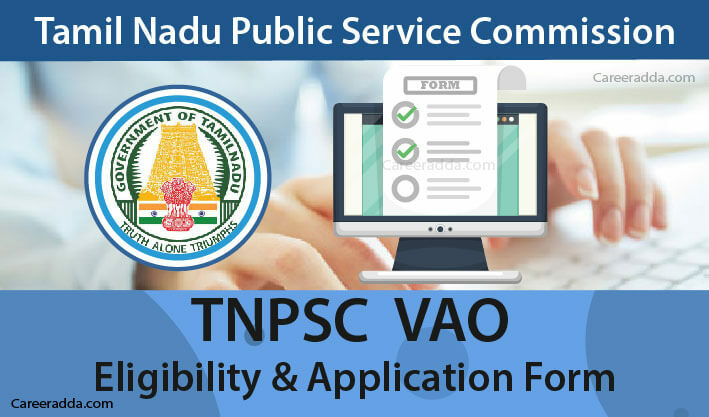 TNPSC VAO Apply Online 2019 : TNPSC VAO 2019 under Group 4 combined civil services application process to submit online application will start after the release of official notification. Eligibility criteria of TNPSC VAO and other Group 4 combined civil services will be given in detail in the notification. The Village Administrative Officer or VAO Position is one of the important positions for which recruitment is made by the Tamil Nadu Public Service Commission regularly. As the state has many villages for which administrative officers are essential, the commission often recruits candidates for this position. From the year 2017, VAO notification is released along with Group 4 Recruitment Notification. For the year 2019, candidates can expect the release of the application form to happen around the month of June. The last date to apply will be tentatively in the month of July. The examination for this recruitment will be conducted as an objective type test in the OMR Sheet. For SC, destitute widows of all castes, BCMs, BCs, MBCs/DCs, STs and SC(A)s – Should have completed 21 years and should not be more than 40 years on 1st of July 2019. For others – 21 years and 30 years respectively for the lower and upper age limit. For differently-abled people the upper age relaxation of 10 years is applicable. For ex-servicemen, the maximum age limit is 53 years if they belong to reserved category. If they are from the general category, the maximum age limit is 48 years. To apply for VAO position with TNPSC, you should have completed your class X or its equivalent education. It means that you should have the ability to apply to higher secondary courses or to a college course. Tamil Knowledge : You should have adequate knowledge of Tamil when you apply for VAO. You should meet the physical fitness Standard-III or better vision. In case of candidates with some defects in their eyes, they should produce eye fitness certificate from a qualified eye specialist. If you are a general category candidate and if you are selected for VAO position, you will have to pay Rs.2000 as cash security within one month of appointment. The deposit amount is Rs.1000 for DC/MBC/BC and BC Muslim category candidates. SC/ST candidates should not have to submit any security deposit. The application form for the VAO Position should be submitted online from the official website of the TNPSC. TNPSC VAO – How To Apply Online? Before you can apply, you should first do the One Time Registration with the website of the commission. Before you apply for any post including VAO with TNPSC, you should have OTR and Candidate Dashboard. You can gather complete details about OTR and instructions at tnpscexams.in/. Once you have the registration details, you can use the User ID and password to login to the TNPSC Website. You will see that the OTR particulars that you provided will be displayed on the screen. Then, you will have to fill up the additional details required for the VAO Position to which you have planned to apply. After entering the details, you will have to pay the examination fee. The payment can be made using Post Office Challan, Bank Challan, Debit/Credit Card or even through Net Banking. If you choose to pay through the online payment gateway, you will have to fill up one more application. You can follow the onscreen instructions to fill up the details for making the payment through this mode. Once payment is made, you will have to provide the payment details in the online application. Once you enter the payment details, you will have to wait for the information from the server. During this process, do not press the refresh or back button to avoid payment failure. If the online application is submitted successfully, you will get the application number. You should note it down for future reference. You need not have to send the print out of the online application to the commission. You can take a print out and keep it for your future reference. If you are registering for the first time before applying for the VAO position, you will have to pay a registration fee of Rs.150. In case you have already registered on or before the 29th of September 2015, you can just pay the examination fee of Rs.100. Full exemption from the payment of examination fee is applicable to SC/ST/destitute women of all communities and Differently-abled candidates. As mentioned earlier, you need not have to submit any documents when applying. For OTR, you will need your signature and photograph as per the specifications that you will find in the OTR instruction from the link given above. For OTR, you should also have complete details about your Class X certificate. So, you should have these details ready when you do OTR. Q. Is It Confirmed That VAO Notification Will Be Issued In June 2019? A. The date June 2019 was obtained from the Annual Planner 2019 published by the TNPSC, where it is stated that the tentative month of notification for Group IV and VAO positions is June 2019. As the commission has stated this month to be tentative, it may or may not happen in this month exactly. Q. Is The Written Test Alone Conducted For VAO Position? A. Yes, TNPSC recruits candidates to VAO position only through the performance in written test. Based on the results in the written test, counselling will be conducted for VAO position.